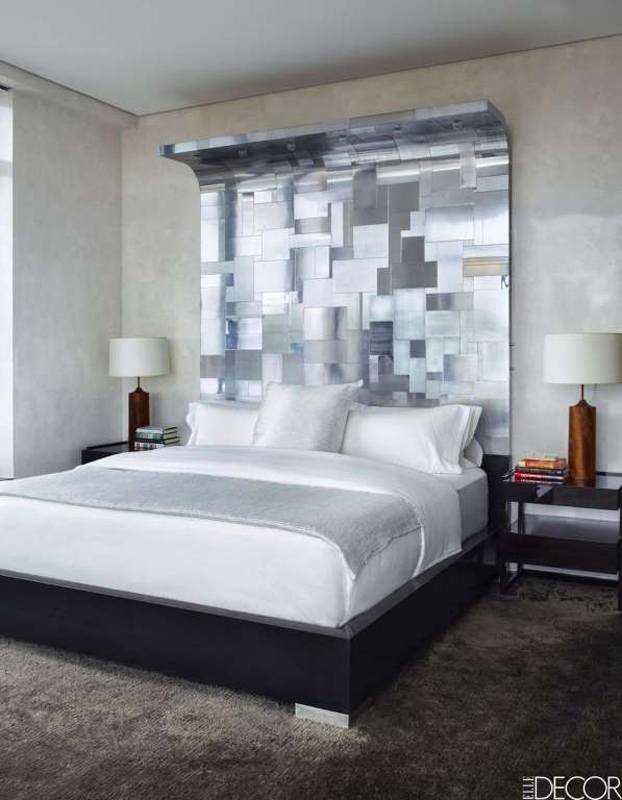 Bedrooms so polished you'll fall head over heels. 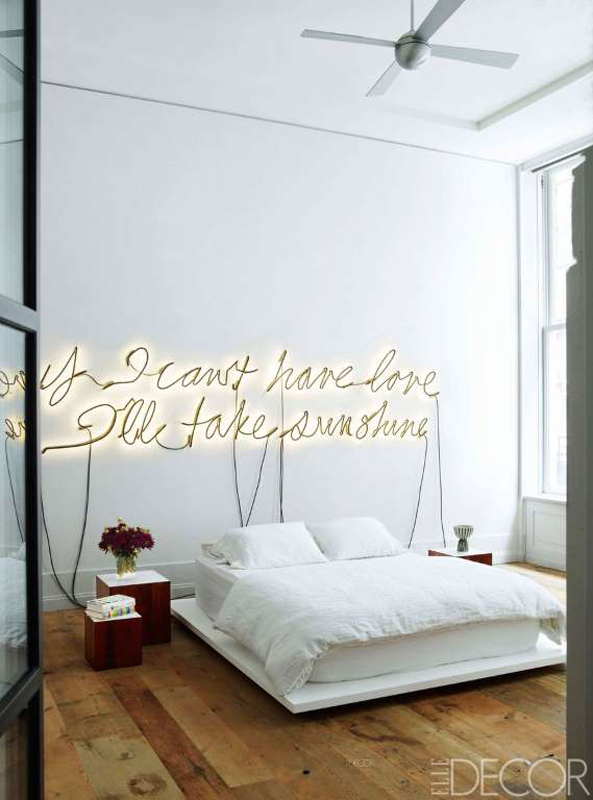 Bedrooms can be a conundrum for those of us with a sleek modern aesthetic. How can a space that's inherently full of pillows and soft bedding also be a tour de force of polished design? Fortunately, it's not an insurmountable dilemma; these 18 modern bedrooms will give you all the inspiration you need to do it right. The bed in this Palm Springs master bedroom came with the house and is dressed in Barbara Martin linens with a blanket and shams by Hermès. The painting is by Daryl Edwards and the wood screen and marble bedside tables are estate-sale finds. In the master bedroom of a California home, the linen coverlet is by Area, the photograph above the bed is by Olafur Eliasson, and the 1930s lamp on the custom-made table is by George Carwardine; the capiz-shell pendant is vintage, and the redwood closet doors are original. In the master bedroom of a Tahoe vacation home, an armchair and stool by Minotti, upholstered in a Holly Hunt leather, are paired with a side table by Jonathan Adler; the bench and dresser are by Lawson-Fenning, and the drawing is by Ching Ho Cheng; the wall is painted in Bank Vault by Dunn-Edwards, and the carpet is by Decorative Carpets. 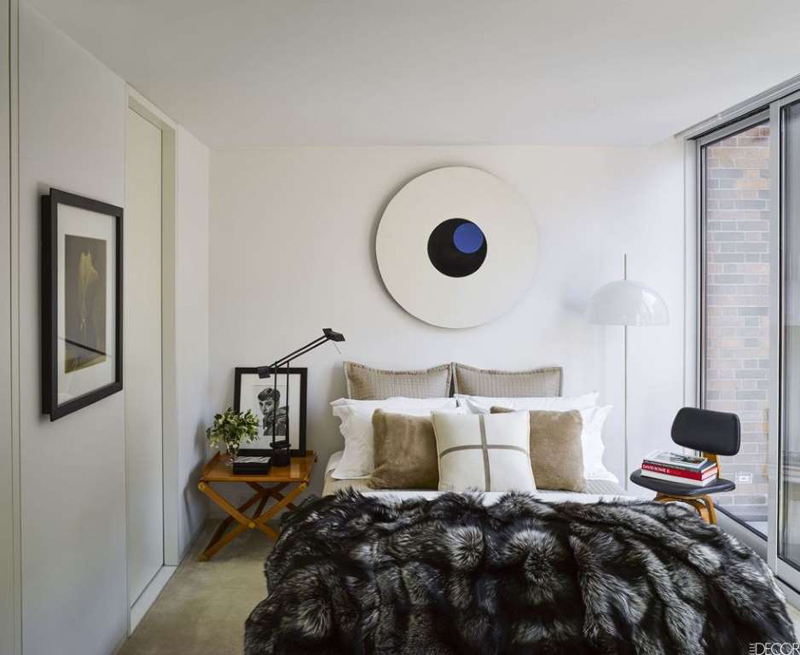 In a TriBeCa apartment's master bedroom, the bed is by Meridiani, the wall lamp is by Serge Mouille, the vintage Poul Kjaerholm daybed retains its original leather, and the side table is by Wyeth; the console is a vintage piece by Paul McCobb, and the circa-1970 Beni Ourain rug is from Double Knot. 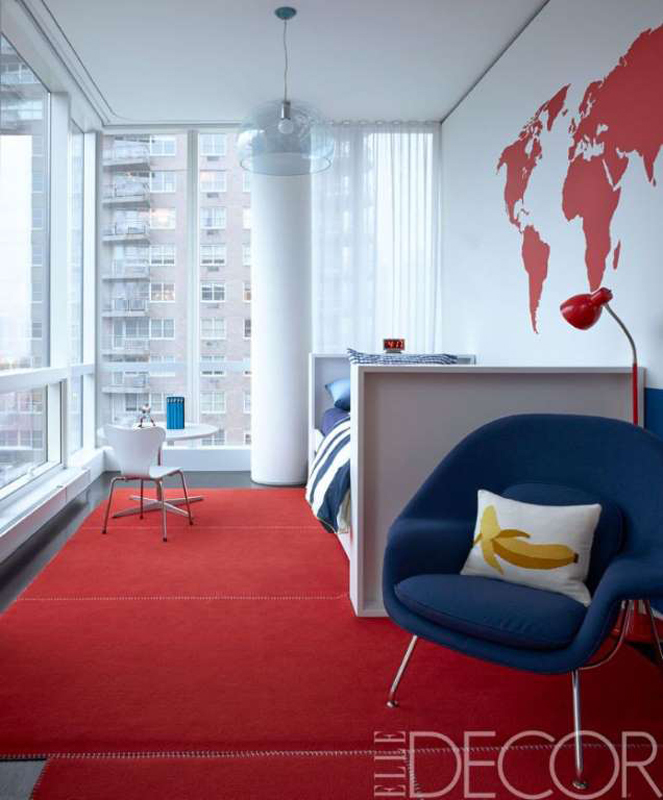 A bedroom in a NYC penthouse features a bed by DucDuc, a Saarinen Womb chair by Knoll, and a pendant light by Kartell; the map decal is by Dezign With a Z, and the felt rug is by Patterson Flynn Martin. In the master bedroom of a modern Tuscan home, the bed and bedside table are Lissoni designs, for Living Divani and Porro, respectively. In a Palm Beach home, the master bedroom's settee by Gastone Rinaldi is upholstered in a Bergamo fabric, the rug is by V'Soske, the walls are covered in Venetian plaster, and the adjacent closet structure is sheathed in acrylic panels; the drawings above the bed are by Ciprian Muresan, and the photographs in the corridor are by Mircea Cantor. 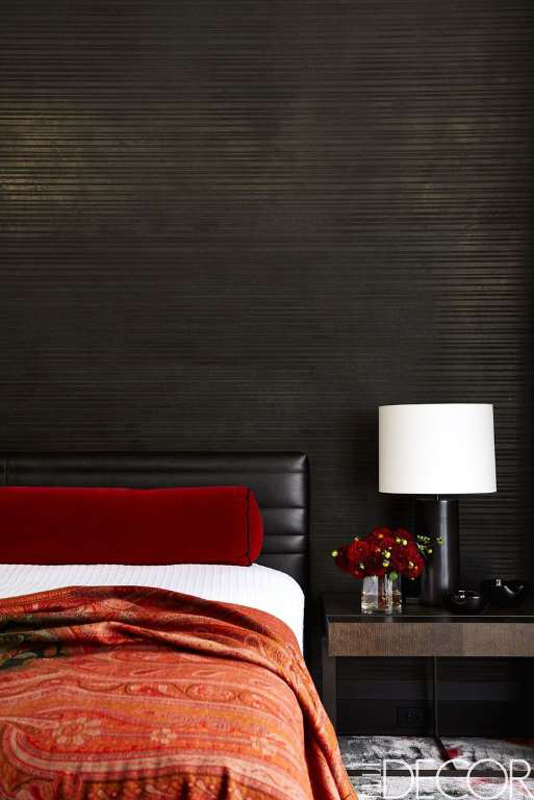 In a contemporary Manhattan master bedroom, a bed by Minotti is dressed in linens by E. Braun & Co., the bedside table is from Philippe Hurel, the custom rug is by Tai Ping, and the walls have a custom textured finish by Atelier Premiere. The master bed in this NYC apartment is upholstered in a Holly Hunt silk and dressed in Schweitzer linens; the stainless steel chair (right) is by Maria Pergay, and the Philippe Hiquily chair purchased at Sotheby’s has cushions in a Fortuny fabric; the curtains are of a Holland & Sherry silk satin, the carpet is by Beauvais, and the walls are sheathed in a Rubelli cotton velvet; the sculpture is by Rebecca Warren, and the painting to the left of the bed is by Richard Prince. 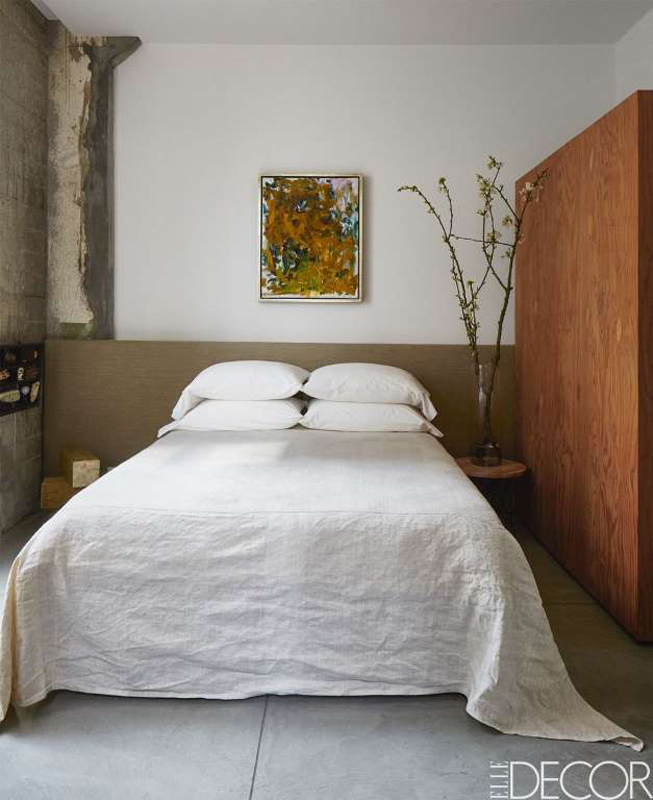 In the master bedroom of a San Francisco loft, the headboard is covered in a Rogers & Goffigon fabric, the bed linens are by Sue Fisher King, the bedspread is antique Belgian linen, the walls are painted in Benjamin Moore’s Super White, and the artwork is by Joan Mitchell. 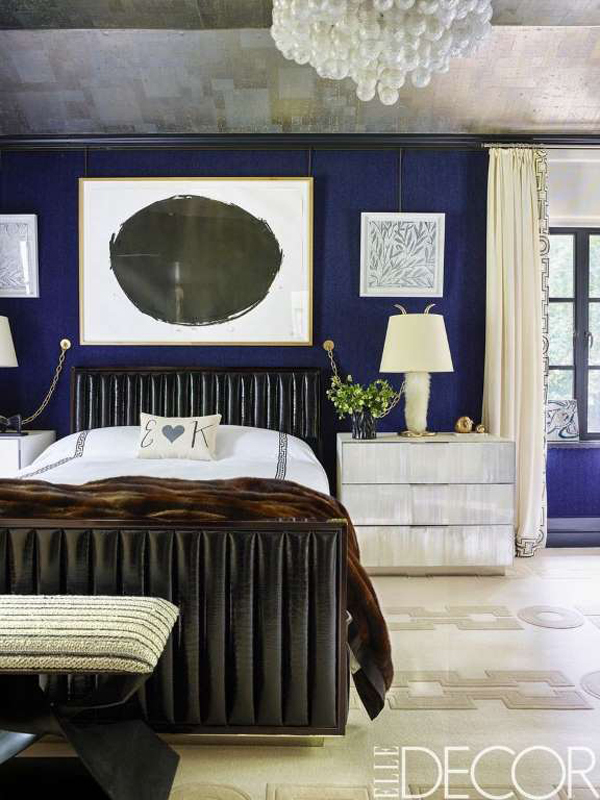 In the bedroom of a West Village home, the vintage Cityscape headboard is by Paul Evans, the bed is dressed in Casa del Bianco linens, the bedside tables are ebonized mahogany, the 1950s American lamps are from Wyeth, and the carpet is by Beauvais Carpets. 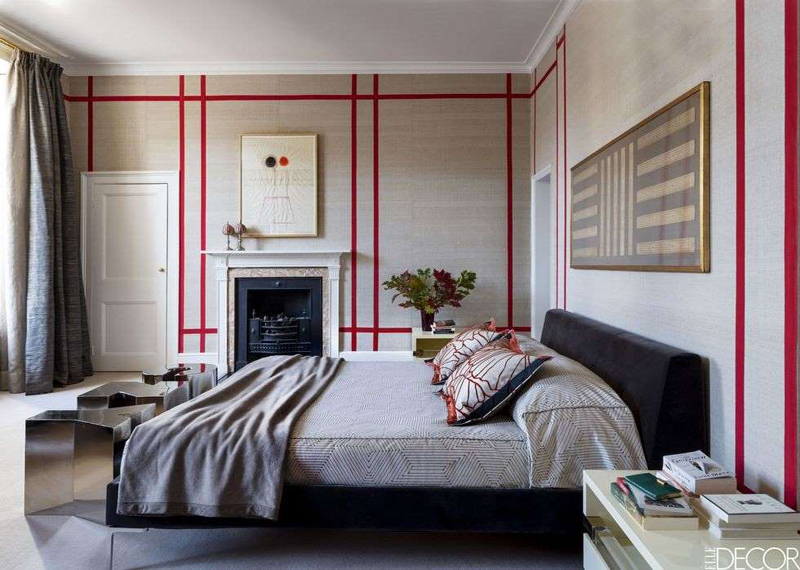 The bed in the master bedroom of a London townhouse is dressed in a custom duvet made from a Dedar fabric, the letter-shaped stools are from Andrew Martin, and the walls are sheathed in a Jim Thompson silk with hand-sewn red silk borders; the drawing over the mantel is by Lluis Lleo, and the work over the bed, which is inscribed with Buddhist phrases, was purchased in Singapore. In a playful New York apartment, a bed by Christopher Ostafin and a 1990s bench by Campion Platt in the master bedroom; the circa-1950 chair by Illum Wikkelso is from Hostler Burrows, the steel side table is Wyeth, the curtains are of a Holland & Sherry cashmere, and the photograph is by Jack Pierson. 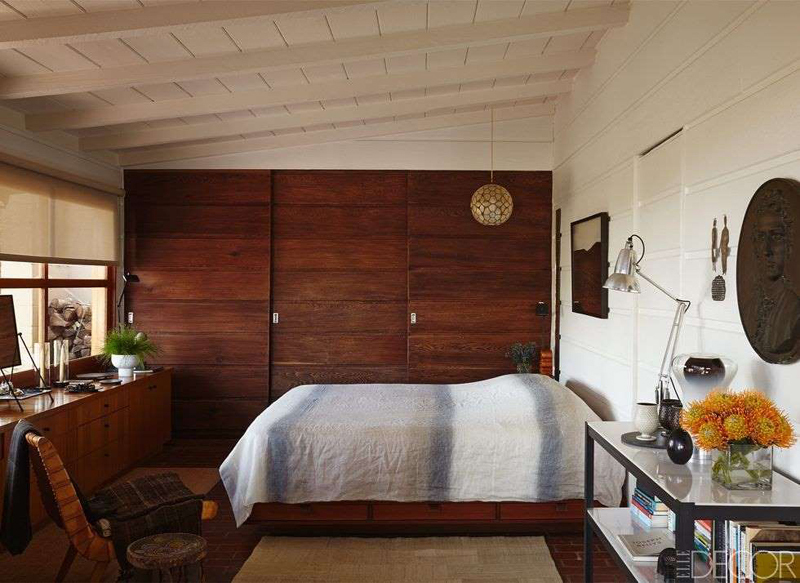 The bed, dresser, and side tables in the master bedroom of a Mexican home are by Roche Bobois; the Eames chair and ottoman are by Herman Miller, the bedside lights are by FontanaArte, and the wall is painted in Patagonia by Comex. The bed in the master bedroom of an upstate New York home is upholstered in an Edelman leather and dressed in Pratesi and Frette linens, the bedside tables are by Jallu Ebénistes, the Carol Egan stool from Maison Gerard is upholstered in a Toyine Sellers fabric and the circa-1970 Mazzega ceiling light was found at a Paris flea market. The walls are upholstered in a Ralph Lauren wool suiting, the ceiling is covered in a Stark tea-leaf paper, the custom wool carpet is by Hokanson and the artwork over the bed is by Richard Serra. In the master bedroom of a Pacific Palisades home, the custom bed is dressed with linens by Deborah Sharpe Linens and a Frette coverlet; the photograph is by David Drebin. 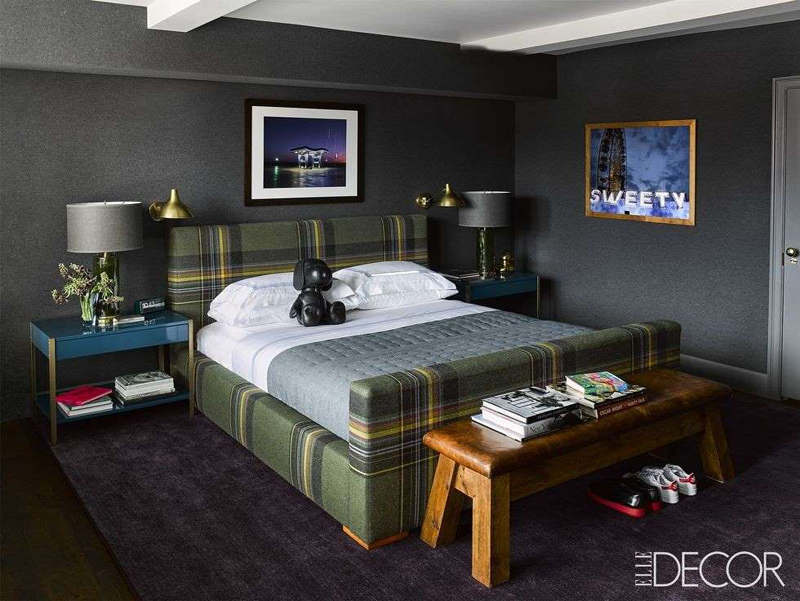 The Ralph Lauren bed in Andy Cohen's master bedroom is upholstered in a Maharam plaid by Paul Smith and dressed with Pratesi linens. The vintage leather bench is from Black Swan Antiques, the custom nightstands are by Blend Interiors, the vintage Pierre Giraudon green-resin lamps are from John Salibello, and the sconces are by RH Modern. The rug is from Crate & Barrel and the walls are covered in a Ralph Lauren Home wallpaper. The photograph over the bed is by Micheal McLaughlin, and the "Sweety" image to the right of the bed was taken by Cohen at a carnival outside Saint-Tropez.